Newspaper picture of the Start. 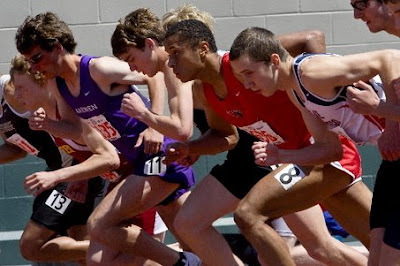 The guy in the red and the one beside him in the white have two of the fastest times in the nation. The guy in purple is the one who beat him last week. Drew is in the middle in black. 100m in and they are out fast! 500 m in and this is the chase pack. 900 m in and in the middle of the chase pack. 300 m to go. Drew will catch the guy in front of him for 7th place. There he is 7th place with a personal best of 4:00.88 That is one second off the school record and a six second record for himself! Way to go on day two Drew. We are very proud of you! Thanks Coach Peit for all your hard work and dedication to getting the team ready for today!